With its self-developed games Cradle of Games wants to bring people together and share an experience. The interactive game mechanism, artwork and game integrate well, allowing players to experience the game. Cradle of Games prefers to choose game themes with which we can convey our enthusiasm for a historical period or subject. We like it if the players learn new facts; … but having fun at playing always takes first priority. Bert Menting (bert@cradleofgames.com) is an IT-specialist, who builds applications and keeps large databases running. Furthermore, he is a developer of games ranging from children’s games, agility games and games for people who like to use their brains. Sander ten Napel (sander@cradleofgames.com) is an artist. He graduated in 1996 at the Royal Academy in The Hague and has since painted and illustrated for numerous projects and magazines. He also has a lot of experience in designing attractions, training games and events and he is an enthousiatic player of board, card and roleplaying games. 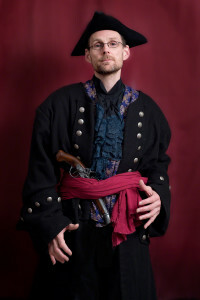 In 2004, a small group of friends, Sander among them, organized the first ‘Puerto Diablo’ roleplaying weekend (LARP). 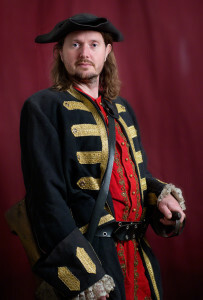 Unlike most other roleplaying events, this one was set in the 17th century. After that, this event took place at a yearly basis, and was played, yearly. Until, nine years later, the story came to an end. After the last event, Sander wanted to breathe new life into the beautiful detailed stories and intriguing scenario that had been built up and he created a card game. Soon it became apparent that, to make a truly new game of great quality, somebody from outside the original roleplaying scene had to take a look at it. From then on, Bert got involved. After the successful realization of Puerto Diablo Sander and Bert decided to create more games. And so Cradle of Games was born!